We Guarantee to return your calls & turn up as promised. We understand that our residential clients need the job to be done the right way – you have to live with the results, and the repercussions if corners are skipped! We believe it is our job to give you that peace of mind. At Blue Sky Plumbing we do things the right way, and submit all council forms where required. Blue Sky Plumbing has extensive experience providing the full range of plumbing services to our commercial clients and real estate agencies - and understand their different needs – you are often just the meat in the sandwich, trying to get a resolution for your client. Our job is to help you achieve that! Jason is not a ”run of the crowd” tradesperson, in fact he would have to be one of the most genuine and honest tradespeople I have ever come across. I found Jason in the little yellow book. Jason will do his utmost to attend to your home and his attention to detail and his workmanship is second to none. I also found him very courteous to deal with. So if you’re considering calling for a plumber…”without a doubt” do not hesitate to call him. He’s the best! Thanks. Fast, reliable service. Jason and his team are great at what they do. The service provided is second to none. I use Blue Skye Plumbing/Drainage and Gas Fitting for all of my home needs and business. No job is ever to big or small for them. Highly recommend to all friends, family and business clients. Thank you for all you do. Thanks so much to Jason and the team, for the work done today. Appreciate you fitting me in Very happy with the job done! Massive thanks to Jason, Renee and Laurie who promptly sorted out the new kitchen plumbing install at our place. Professional and quality workmanship, showed up on time and left the place clean. Thanks again guys! I first contacted Jason from Blue sky plumbing approximately seven years ago (2009) to fix a gas plumbing issue we had for a property we manage through our Real Estate business. From the very first I found Jason to be reliable, trustworthy and nothing is ever too much trouble. His work ethics are first rate and his prices are reasonable. Jason quickly became our primary plumber and first point of call for our Landlords rental properties. Jason is efficient, friendly and really goes the extra mile to provide amazing and reliable service. Put him on speed dial if you want a great plumber to do the job properly. Blue Sky Plumbing is a full service plumbing company; we do everything. With over 18 years in plumbing experience, you can be sure you’ll receive a long term solution. Owner, Jason Vella is fully licensed, with all of his endorsements to ensure that we are able to meet all of your plumbing needs. And we have individual experts that specialise in all different areas of the plumbing industry. Blue Sky Plumbing knows one thing for sure; that you deserve the very best. Our #1 assurance to you as our client is that we care about the safety of people, so our team will set you and your plumbing needs up for a long term solution; because we believe in quality service. 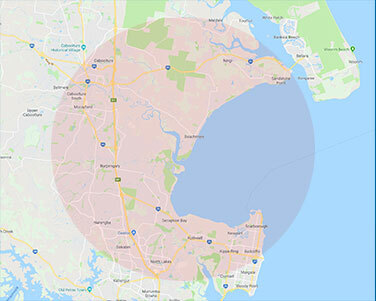 Our team will meet you where you’re at in the Caboolture/Bribie Island area through to Northlakes and surrounding suburbs. We also offer after hour’s services, meaning you don’t need to go another hour without having the issue fixed.